The apparition above was spotted as I headed to the rugby in downtown Houston a couple weeks ago (USA v. Ireland, for the record). Looking a little like a ‘80s VW van that’s undergone weight training, this counts as one of a handful of Pinzgauers I’ve ever seen in the wild. After the match I managed to get some additional shots under nighttime conditions, which we’ll get to presently. An earlier writeup by the estimable Mr. Niedermeyer can be found here. 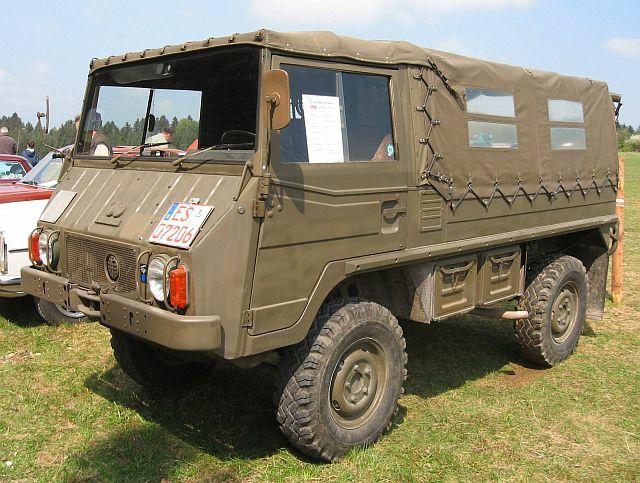 A product of the venerable Austrian firm of Steyr-Daimler-Puch, and named after a variety of draft horse, after a two-year design process the Pinzgauer went into production in 1971 as a low-maintenance, light military support vehicle adaptable to extreme off-road conditions. Famed for its spectacular off-road prowess and used by more than 20 military arms, both 4 x 4 and 6 x 6 variants have been produced. First-generation models (through 1985) were powered by an unusual air-cooled in-line 2.5 liter (later 2.7 liter), four-cylinder gasoline engine mounted horizontally on a central structural spine. A ZF five-speed transmission drives the wheels through swing axles with geared (‘portal’) hubs that provide additional ground clearance compared to more conventional designs. The front and rear differentials can be locked individually when needed for extra traction. Post-’85 versions retain the general layout but sport water-cooled, turbocharged diesel power, and can be identified primarily by an extended snout housing the radiator. Due to import restrictions, however, not many of the second-generation vehicles have made it to the US. Following the breakup of Steyr-Daimler-Puch around 2000, manufacture of updated second-gen versions eventually fell to BAE Systems, which continues production. 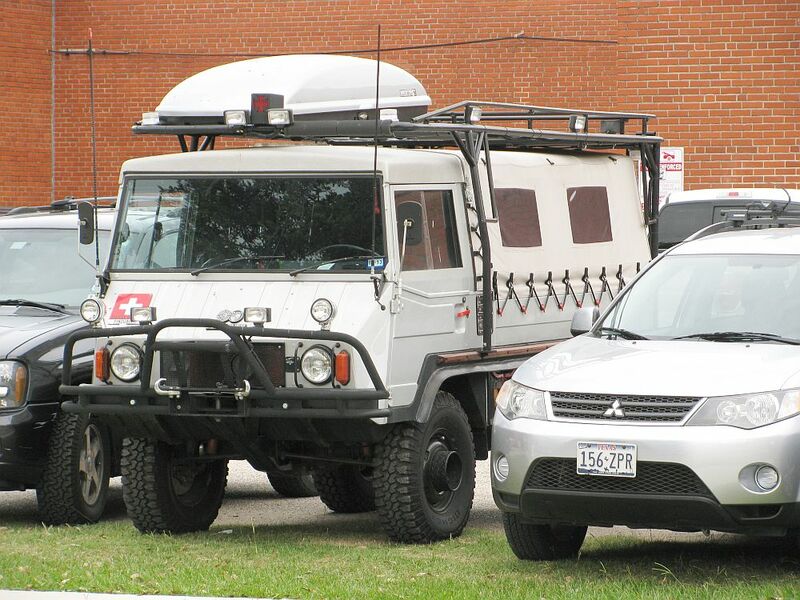 Several body styles exist, including command, communications and ambulance variants, but the most common version, and the featured vehicle, has a low-sided cargo box with a canvas top. 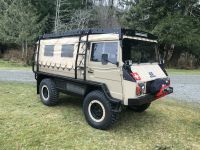 With its rugged powertrain, relatively compact size and mountain-goat abilities, the Pinzgauer has developed something of a cult following in the US. Pinzgauer mania may or may not be attributed to a glowing July 1978 article in Car & Driver, which was where I first heard of it. Several companies in the US have taken advantage of relaxed importation rules for vehicles over 25 years old and have established a small but lively business selling mostly first-generation machines. Although many of these seem to be going to private owners with a taste for the exotic, a small market of tour outfits specializing in Pinz-based off-road adventures has sprung up around the availability and relatively low cost of these vehicles. … there are several things that make them less than ideal for this application. Probably most important is that used, non-armored examples are fairly expensive, ranging from about $50-100,000 in the current market. Also, despite being considerably larger than a Pinz, especially in width, their passenger-carrying capacity is actually less. 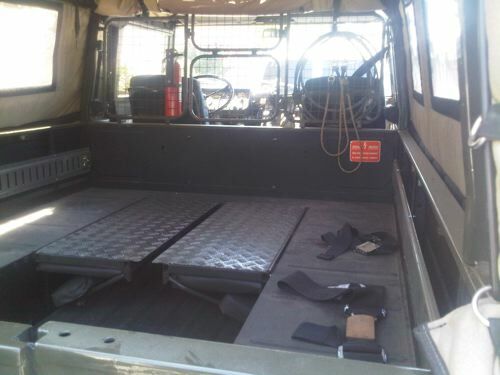 … or, as a sort of motorized sedan chair, pickup-based 4 x 4s with enclosed, A/C equipped cabins. 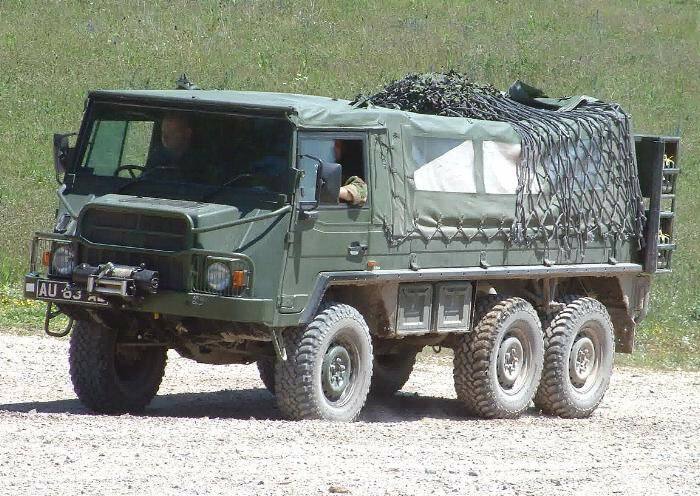 Compared to these, depending on configuration a Pinzgauer will seat ten (4 x 4) or 14 (6 x 6) with considerably greater poor-surface and rock-climbing ability. Additional benefits include a relatively low initial investment (unrestored but running vehicles start at as little as $10-12,000) and (apparently) relatively high reliability. Back to the vehicle spotted in downtown Houston, which may be, er, the Cadillac of Pinzgauers. This is a 1972 710M with the soft top, customized in overall silver-gray with a very subtle flame job and numerous, humorous details (for example, check out the yin/yang symbols on the wheel hubs). During research for this post, I happened to stumble across an Internet listing showing this exact vehicle for sale in California in September 2012, at an asking price of $40,000. Perhaps some deep-pocketed Texas rugby fan (how many can there be?) has taken the plunge. There’s a nicely fabricated brush bar in front and a surrounding cage capped with a roof rack seemingly sturdy enough to carry around a small building, and festooned with enough auxiliary lights to illuminate the stadium near where it was parked. Note the various externally-mounted accessories; isn’t it a pain when you have to dig your entrenching tool out of all the crap in your trunk? While Houston’s mostly concrete streets are notorious for heaves and cracks, I’m not sure you really need something quite this rugged to negotiate them. 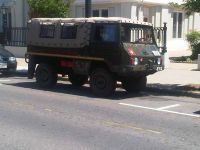 From that standpoint, I’d say we are looking at a vehicle that is more about making a statement than fulfilling a need. On the other hand, it’s not entirely unsuitable for the urban environment. The footprint actually is smaller than the typical full-sized extended-cab pickup one tends to find around here, the view from that high-mounted driving position must be superb, and one has to think that the sheer presence of the thing would cause traffic to make way like Moses parting the Red Sea. The one thing the owner might consider changing is to install a hard top – there’s a lot of theft from vehicles around here. Actually, not as much as you may think. No armoring, you see, and with only 95 horsepower dragging 4100 pounds around, not much scope for adding any. The up-armored HMMWV is a better choice if you’re expecting to take small-arms fire in your particular post-apocalyptic wasteland. Ireland, but it was a pretty crappy match because neither side scored a try. Looks like USA still has a way to go before they are a power in the sport. 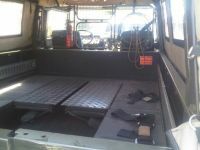 Here’s a link to the latest model Pinzgauer 2. It hasn’t found any orders yet..And you can see it has a longer bonnet. A bigger problem with these is the IED ( Improvised Explosive Device) or roadside bomb. The newer vehicles have bonnets..So that when/if the vehicle drives over an IED and sets it off..The engine and chassis absorb the blast and the cab escapes thew worst effects of the blast. 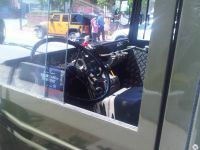 A Cab Over Engine (COE) design leaves the occupants vulnerable.. Either way the vehicle will be destroyed but the occupants in a COE design are at more risk of suffering injury. …unless any of the streets are less than 30ft wide… then the HMMWV gets a bit stuck. Cool find. Good eye, too, in being able to identify it once you found it. That wussy little minivan-style rooftop carrier simply has to go, though. It completely ruins the look of such a he-man vehicle. I have no idea why, but I find this quite cool. I guess it could be useful when traffic backs up on the interstate highway, allowing the driver to just go offroad to the next exit. I would imagine that your parking options would increase as well, due to the ability to get to more places. I love the no-nonsense interior. So refreshing in our era of nanny-cocoons. Wouldn’t mind one of the later diesel versions living in my driveway tho’! Au Contraire, my good fellow; the Pinz is far from top-heavy! I have no idea how they put all their weight so low without a lead-filled keel, but they do manage! 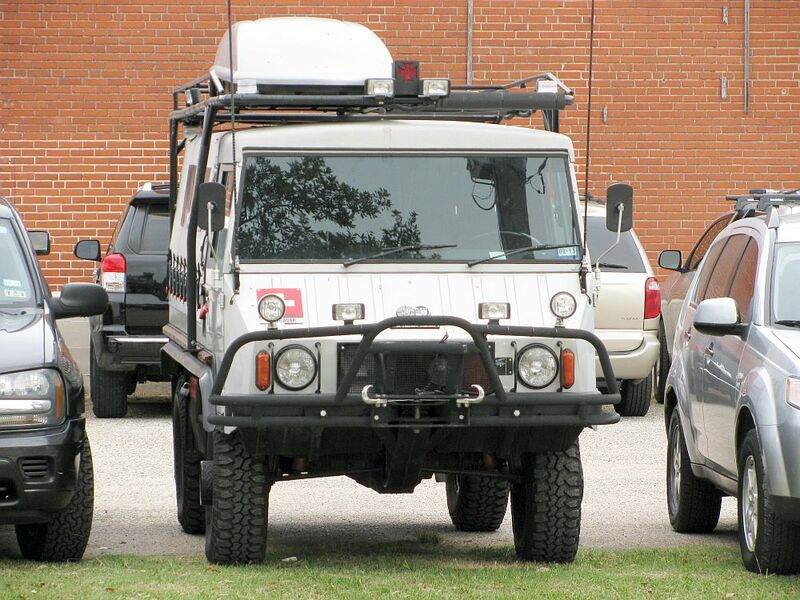 Look up the Pinzgauers and Unimogs on utube. They are phenomenal. And with gas mileage in the upper teens, what’s not to like about the Pinz? 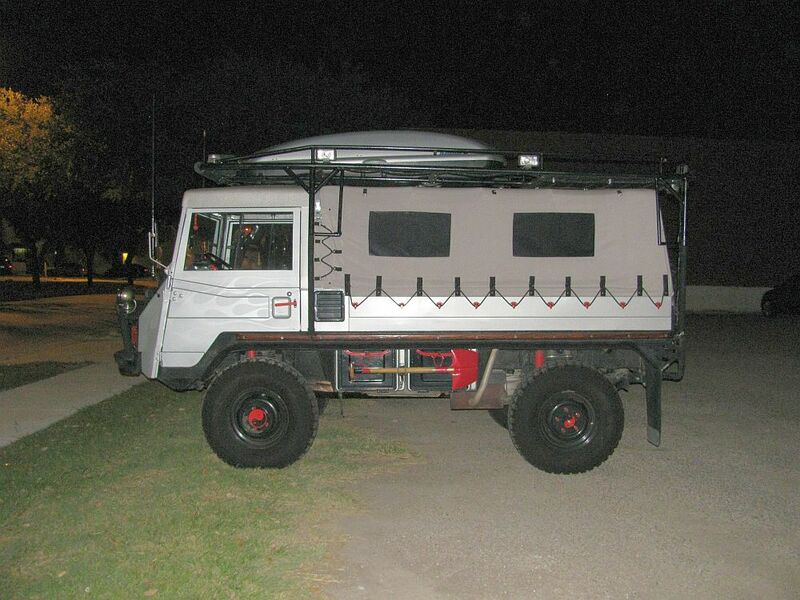 When the teenagers show up with their me-too stud cars and rev their little engines to attract the female of the species, the man who could not care less shows up I’m his MGTD, Unimog, RatRod, or Original Anything and can’t keep them off his upholstery. The Mog or the Pinz is the battlewagon to let your boy take his date to the Prom! Never heard of them (and somehow missed Paul’s earlier writeup), but it looks awesome. The inimitable David E’s C&D article made for amusing reading too (“…take off all your clothes, set fire to your hair…”). 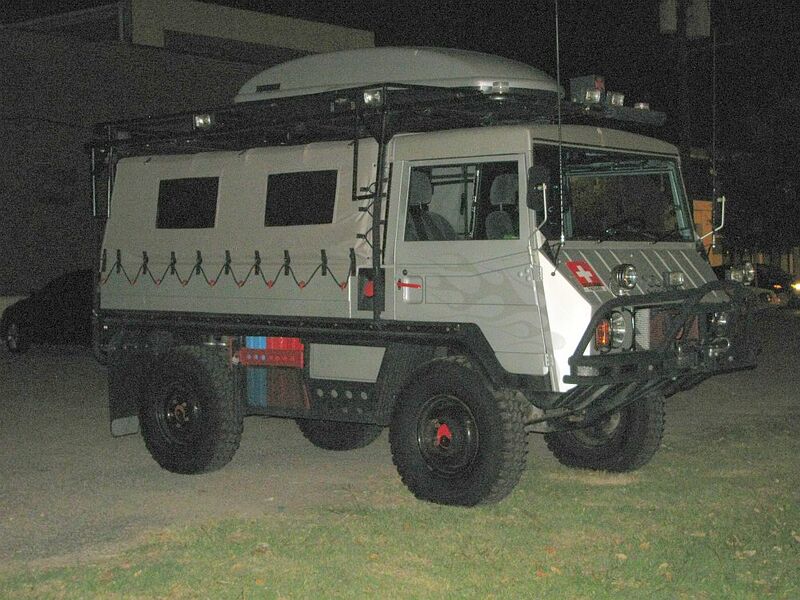 A Pinzgauer with a camper body would be the ultimate go-anywhere motor home! I’m surprised you haven’t head of them, our army’s got a bunch of them, but as I understand they spend most of their time parked up, as we haven’t got enough drivers. There was some drama with them back about 10 years ago when they were taking too long to arrive or something, and the army used a bunch of 4×4 utes as stop-gaps for a while. Yeah, I was surprised as well! I thought we only had Unimogs, but that’s only because that’s all I ever see driving on the road – but I never gave a thought to what vehicles they may have that I haven’t seen on the road! And now you mention it I think I do vaguely recall a drama about army vehicles a few years back – something to do with replacing the Unimogs, so I guess that may have been the Pinzgauers? I’m educated about our Pinzgauers now anyway lol! If this one’s too big there’s also the Haflinger. 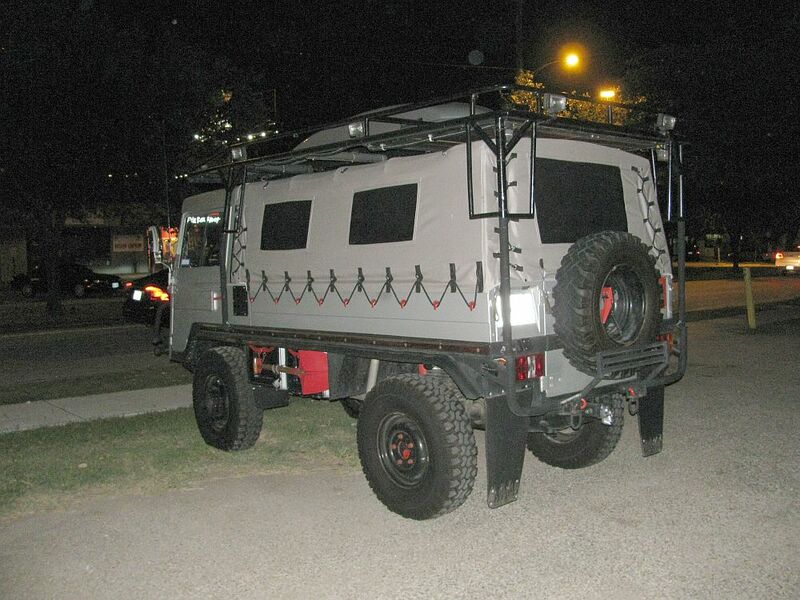 Which is, like the Pinzgauer, the name of an Austrian horse breed. 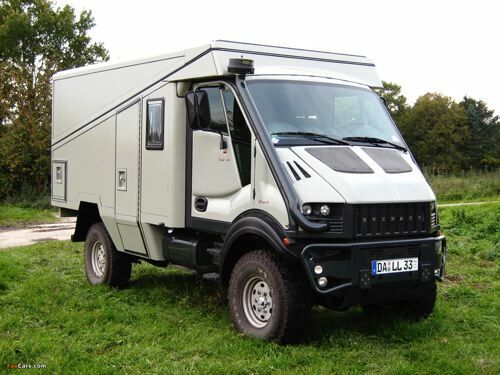 Direct competitors of this Pinzgauer are the epic German Unimog and the Italian Iveco Daily 4×4. Iveco is Fiat’s van- and truck division with its own line of diesel engines from a 2.3 ltr. 4 cylinder to a 12.9 ltr. 6 cylinder. 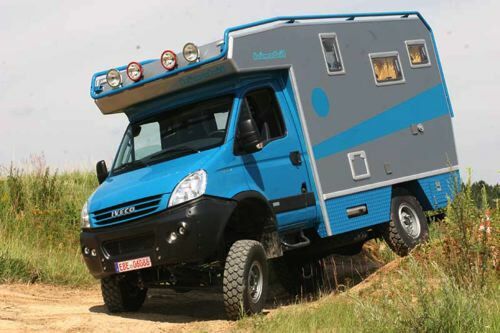 Here’s a picture of the Iveco with a camper unit. Finally!! Pinzgauer and similar deserve much more coverage on CC. I am also in Houston and have seen another one around. Will try to get a picture if opportunity arises. Can’t see why these are not more popular with the hunting crowd in South Texas. Maybe you weren’t around then? The folks at Steyr-Puch have always been true master builders of heavy-duty off-road vehicles. From the small Haflinger I mentioned above to all-wheel drive dump trucks, from the Mercedes G-class (co-operation Mercedes and Steyr-Puch) to farm tractors. I saw one of these a couple of weeks ago in Graz, Austria. I had no idea what it was, so thanks for the article! Another example of the “Austrian School” of automotive design, Ledwinka & Porsche being its founders. 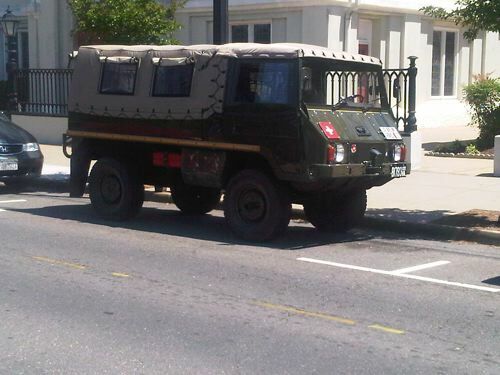 Someone at work has one of these, I think a 6×6, in military livery. I’ll have to hunt him down & get his impressions. 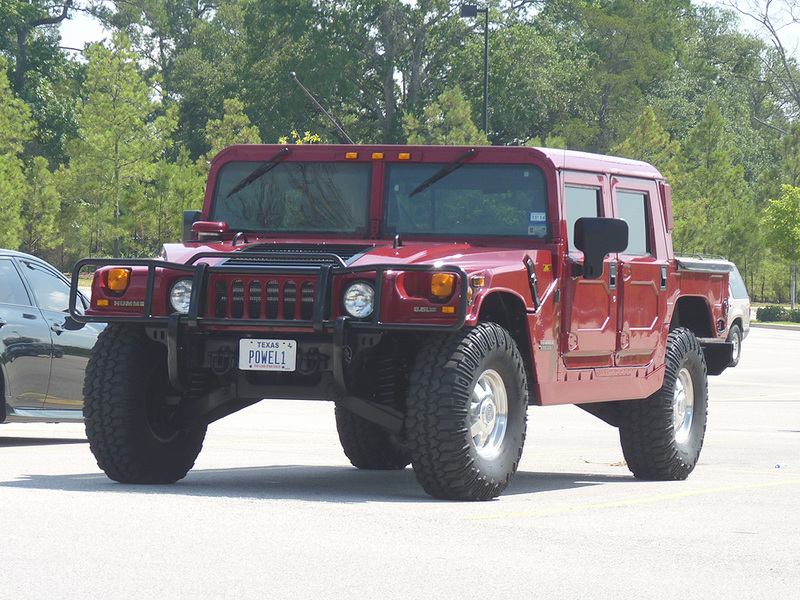 BTW Hummers, like Jeeps, were not intended to be in the line of fire like APCs, requiring armor. The sort of wars we fight nowadays have changed that. South Africa has been an innovator in this field, the Marauder being its current instance of the “Road Warrior” type of wheeled APC. These are impressive – and attractive. I, too, remember David E.’s glowing write-up about the Pinzgauer in 1978. And it’s natural today that we are thinking of our commutes in the post-Apocalypse world. Two words for that, though: NO….GASOLINE. There won’t be a whole lot of joyriding in the Zombified world. Fact is, there won’t be ANY. Gas stores, even by friendly enclaves, will be STRICTLY rationed – and hoarding or wasting vital stores is generally a crime punishable by death. Once we’re all spotted where we think we’ll do best…there won’t be much moving around. Roving banditos; natural obstacles…yes, and no gasoline; and no repair parts. When civilization crumbles, it’s going to be bicycle…horse or mule…or shoe leather. While those shoes hold up. Thanks for the fine write-up on one of my favs. I saw the little Haflingers in Austria, but was very impressed when this came along. It was a very impressive piece of engineering, but based on the classic Ledwinka/Porsche principles laid down decades earlier. I too remember the Davis post in C/D, but had read some about it before. 1978 was the year I started reading Car and Driver. I remember that article well. Reading it again has convinced me Car and Driver is gone. Davis may have played to his own drummer, but he published a 9 page article on a car that never reached the US market and it’s still an engaging read. 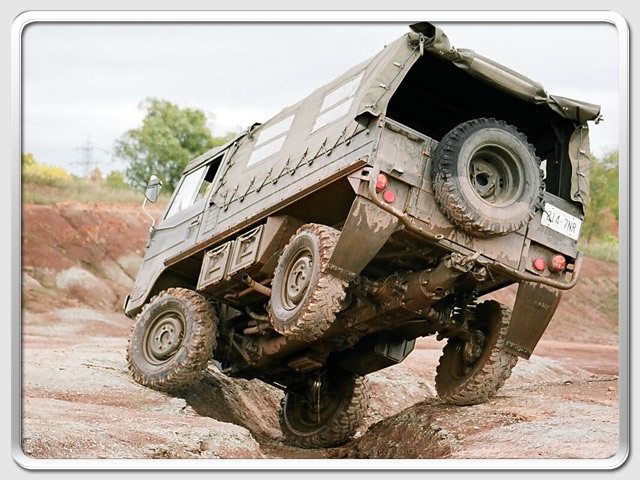 Also, the article revealed what those flanges are on the front wheels of the CC Pinzgauer. They’re steps! Germany~Austria~Czechia, the “Off-road Triangle” ? 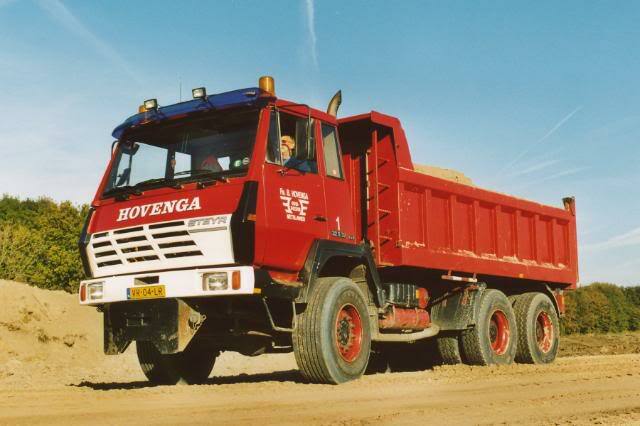 I really think that Iveco trucks (see picture above) are more German than Italian. Fiat/Iveco took over (swallowed ?) the renowned Magirus Deutz company many years ago. Anyone familiar with them ? The church of the city of Ulm was in their logo. And they also were true off-road specialists. 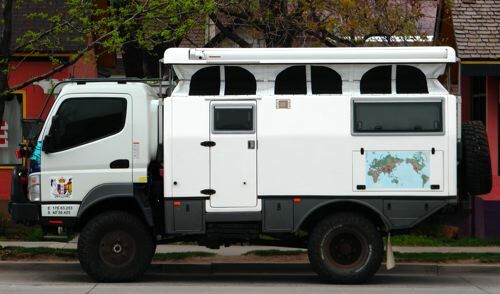 a sturdy and compact 4×4 diesel truck. They already did it with that sissy Fiat Ducato van, so why not with the real thing ? Here’s a Magirus Deutz with the church of Ulm and the big Iveco “I” already on the grille. 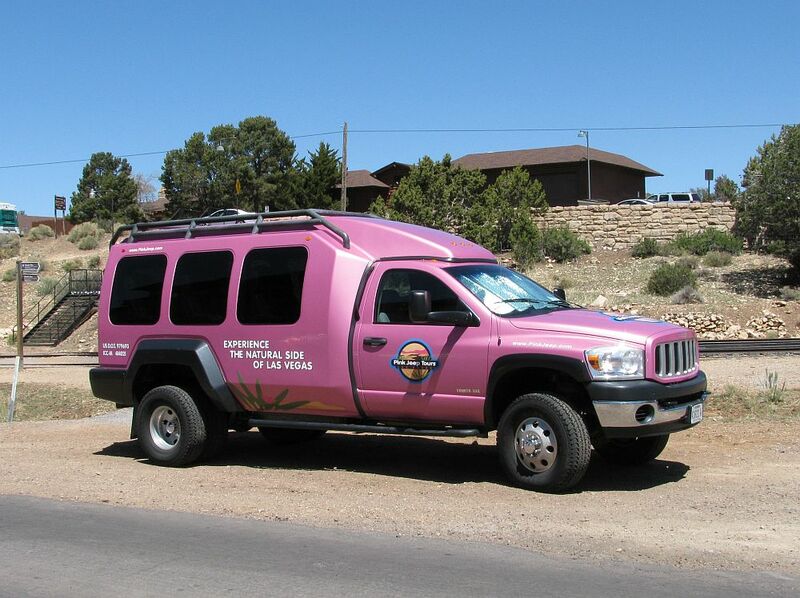 Moab, Utah…is a mecca for terrific unusual 4×4 vehicles. They do radical engineering rather well in red rock “Desert Solitaire” land. That’s where I got this photo. That’s a long way from home – New Zealand crest on the front door and flag below the windshield. Apart from a wheel & tire swap (and camper obviously) it appears to be a standard 4×4 truck. 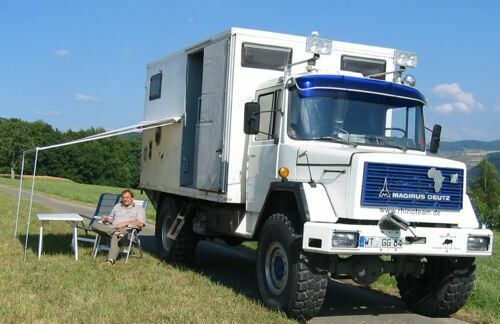 Like the Iveco above I don’t think they would stay with a Pinzgauer in the extremes. In reference to back-country tour vehicles, years ago I went on the Ridge Top Tour at Arkaroola at the north end of the Flinders Ranges in South Australia which had Landcruiser HJ79 pickups with an open top seating body (including a massive rollover frame). The tour runs along old mining exploration roads, and to give an idea of the terrain they wear out a set of tires in 5000 miles or so. The Iveco is ranked somewhere between a Defender and a Unimog, so it should be a capable off-roader without any special aftermarket treatments. 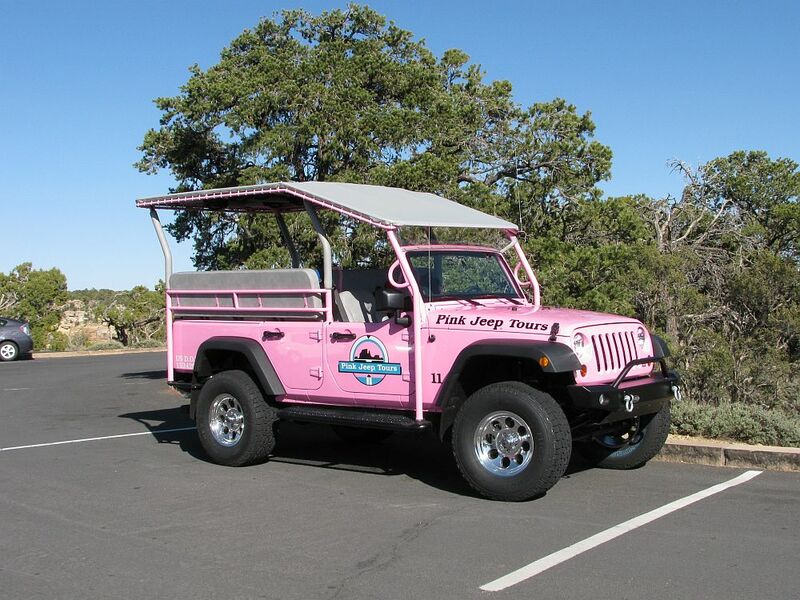 Great off-road vehicle, designed to get through anywhere (and literally, anywhere! ), with max payload! On road, however it can almost be dangerous, if driver forgets what he’s driving (or has a head-on collision with anything sturdier than plastic garbage container…). 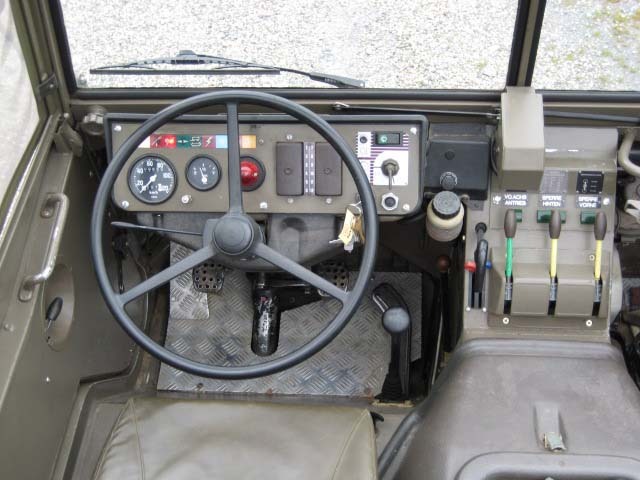 A quite while back, during my military days, there was a joke around drivers of these that those who hadn’t rolled a Pinz, hadn’t driven them at all 🙂 Exaggeration, surely, but does show how unstable they can be, like most of similar vehicles with portal axles, a lot of wheel travel and consequently very high center of gravity. 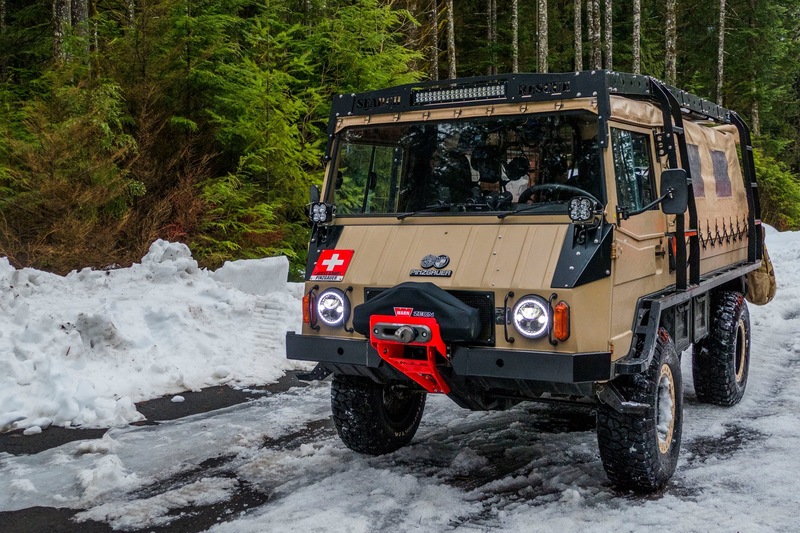 And yet…I , as a occasional offroader / farmer/ hobby carpenter, would like to own one, 🙂 There are quite a few of them in the ads, cheapest 710m ( soft top) selling for 3000-5000 EUR, 710K (metal top, usually ambulance or command vehicle) and 6×6 being offered from EUR 4000 ( beaten-up example, spending their non-military life dragging firewood…) to 8000, for very well-preserved examples. 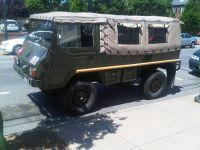 We have a Pinzgauer (apparently a 1972 710M 4 wheel as well) in the neighborhood. I was going to do a write up but since there was already one done I did not think to duplicate. It resides in the historic district probably owned by one of the moneyed crowd that owns one of the large older homes that line The Plaza. We duplicate more and more. My older Pinzgauer post was not a full-on CC, just a Capsule. Plus, there’s always different ways to approach any vehicle. And memories are short…. Sweet looking rig. I seem to remember seeing a Steyr Pinzgauer near where I live. I would’ve thought a vehicle like this would’ve been powered by a diesel engine, possibly a 1.8 litre or a 2.5 litre engine. I’ve been building my 1972 710M 4×4 up for Search & Rescue use. So far it has proven adept at the task. I’m able to take up to 9 searchers into the field. When we have the subject packaged up in the litter and ready for extraction I can fold down one of the benches in the rear and up to four attendants can sit across from them and manage aid while bringing them out of the field. It has been on several missions now and continues to perform reliably at a very low operating cost. There’s more photos on my Facebook page for those who are interested..